After a quick trip to the West Coast last weekend, I’m all about news this week... My thoughts on Ilichevskii’s Matisse, will be on the way soon: I finished Matisse on a flight to California and then wrote a draft post, but I don’t think I write well over the Great Lakes. First English PEN Literature in Translation Award. I learned from the Three Percent blog that Arch Tait will soon receive English PEN Literature’s first translation award, for his translation of Anna Politkovskaya’s Putin’s Russia, published by Harvill Press/Harvill Secker. The award will be presented on November 8. I’m still making my way through my first issue of Сноб (Snob) magazine… and I still haven’t decided what I think of it. One Bookshelf reader, Steven Lubman, commented that Snob is “opulent,” and that’s a very apt description: it’s beautifully produced, with heavy paper, inserted bookmarks (! ), splashy design, and excellent photographs. My biggest problem with Snob (other than the irritating name) is the same problem I face with other magazines: it’s a magazine, and I prefer reading books, specifically novels, at the end of the day. Speaking of loving books: travel is always more fun with an excursion to a Russian bookstore, so I stopped at a shop just off Highway 101 in Tarzana, California, last week. I bought so many books for $76 that I went straight to the post office, filled a large flat rate box, and sent it home. I focused on the first half of the twentieth century but also bought a book of stories by Fazil Iskander – I’m still hoping to find a truly favorite writer whose name begins with I/И so I can continue my A to Я series – and saw lots of detective novels and books by popular literary fiction writers such as Rubina, Sorokin, and Ulitskaya. I was happy to find an affordable set of Sholokhov’s Тихий Дон (The Quiet Don/Quiet Flows the Don), which Steven Lubman also mentioned in his afore-mentioned comment… I’ve been wanting to try the Don again after not liking it, in translation, much years ago. I also bought a collection of Boris Vasil’ev’s short novels and Solzhenitsyn’s First Circle, which I read and liked years ago in translation. I’ve been so completely focused on very recent releases for so long that I’m looking forward to reading and rereading some modern classics. Various Translation Releases &tc. The fall 2010 issue of Чтения/Readings focuses on Anton Chekhov. The journal is bilingual; the table of contents is online… More A.P. Chekhov news: Stanford University Press will release Five Plays, with new translations by Marina Brodskaya, in November. Tobias Wolff’s introduction is available online… New York Review Books released The Road, an eclectic collection of writings by Vasily Grossman, edited by Robert Chandler and translated by Elizabeth Chandler, Robert Chandler, and Olga Mukovnikova. Ken Kalfus’s review from The New York Times Book Review is online here… Today’s New York Times Book Review includes a piece about Ian Frazier’s Travels in Siberia, which reviewer Joshua Hammer called an “endlessly fascinating tale.” I enjoyed the excerpts in The New Yorker very much but am not sure I’m up for a 500-page nonfiction book now that I have so many thick novels on the shelf… One final note: my review of Martin Cruz Smith’s Three Stations, which I wrote for The Pennsylvania Gazette, my university’s alumni magazine, is online here. I’m especially excited because this is my first review for a print publication. Up next: The Matisse piece, drafted aloft, soon to be edited on land. Then Dovlatov’s Зона (The Zone), which took time to hook me. I’m reading The Zone together with Danzig Baldaev’s Drawings from the Gulag, which is a tremendously useful and nicely designed documentary book about the Gulag system. 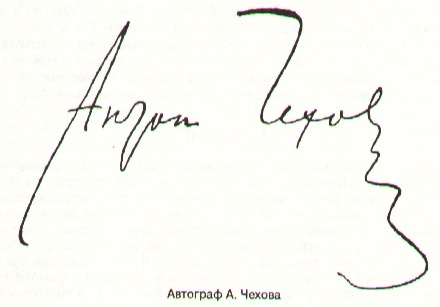 Image credit: Chekhov’s signature, from user 53RUStm, via Wikipedia. Leonid (Yuzefovich) Iuzefovich’s "Казароза" (Kazaroza) is a pleasantly perplexing book: on the surface it’s a heady murder mystery that involves Esperanto and is set in two time tracks, with more 1920 and less 1975. Though the book wasn’t difficult to read I – that stubborn reader so partial to smooth narrative unless the book is called War and Peace or Daniel Stein – came away feeling a little jumbled after sorting through a fragmented, cubist-feeling novel that toggles between decades and presents texts for songs, articles, and even posters. If forced to summarize in a phrase what Kazaroza is “about,” I’d probably choose something like this: fragmentation of many types and utopian ideas for bringing people together. With a setting that involves the civil war and multiple references to the Tower of Babel, Iuzefovich emphasizes cultural and political divisions. As for the underlying plot: singer Zinaida Kazaroza is shot and killed during a concert at an Esperanto club while singing an Esperanto version of Lermontov’s “Сон” (“The Dream”; the word also means “sleep”). Of course the poem’s words have significance in the scene, and murder is the ultimate act of division, separating life from a body. Iuzefovich’s love for combining fact and fiction means he works in information about the history and politics of Esperanto, too. A brief historical digression that’s relevant to the novel: Esperanto originated with one Ludwig Lazarus Zamenhof, a polyglot who grew up in Bialystok, (then) Russia. 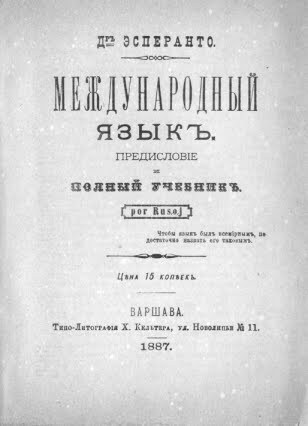 Of course I had no idea that the first book about Esperanto was written, by Zamenhof, in Russian, and published in 1887. Nor did I know about political and religious implications of Esperanto, or conflicts that arose within the Esperanto community when some saw Zamenhof’s Esperanto as too inflexible. Also: Iuzefovich based Kazaroza on a relative who sang under the name Zinaida Kazaroza. Iuzefovich includes many lovely descriptions of people and habits (I particularly liked: “Врал он нередко, но всегда сухими губами” – “He lied sometimes, but always with dry lips.”), emphasizes the importance attached to labels by describing the naming and renaming of streets, and shows us how the living try to take possession of the contents of the dead Kazaroza’s purse. (You know what they say about a woman’s purse…) I suppose it’s fitting that Kazaroza, a sort-of-a-detective novel that’s wound up in the elusiveness of language and unity, seems so indescribable. And that I may read this oddly enjoyable book again – it’s grown on me – taking more time to play metaphysical detective myself and piece together the shards. Level for non-native readers of Russian: I’m not sure… Moderate? I thought the choppy narrative was more difficult than the vocabulary. Up next: Aleksandr Ilichevskii’s "Матисс" (Matisse), another perplexing book, though less enjoyable than Kazaroza. P.S. : I don’t often hear about Russian-related translator events so am very happy to mention a few upcoming talks... Marian Schwartz will speak twice next week, once reading from her translation of Olga Slavnikova’s 2017, once about “The Literary Translator and U.S. Publishing.” Details are on her site, here. On October 30, at 5.30-7.30 p.m., Crawford Doyle Booksellers, an independent bookstore at 1082 Madison Avenue in New York City, will host Richard Pevear and Larissa Volokhonsky. They’ll read from their new translation of Doctor Zhivago. Image credit: The Esperanto page on Wikipedia. 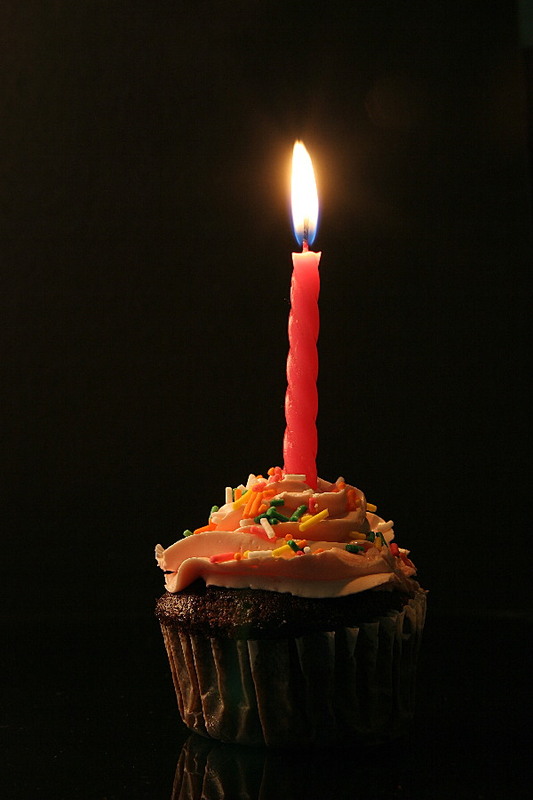 I love putting together posts for my blog’s birthday! It’s fun marking the passage of time – it’s hard to believe I’ve already been blogging for three full years – and it’s always interesting to look at statistics about what visitors seek and read. 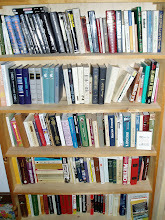 It’s you, the readers who visit the Bookshelf, who make blogging so rewarding. I didn’t have many expectations when I started blogging three years ago, but I certainly didn’t think I’d meet so many of you in person and by e-mail. I love the solitariness of my reading and writing, but I also love the fellowship that so often grows around books. A big thanks to all of you for your comments, messages, and ideas. Geography. Not much has changed in Bookshelf geography since last year: by country, the largest number of visits comes from the United States, but many of you are in the U.K., Russia, Canada, and Italy. The top city is London, which makes me look forward to the 2011 London Book Fair even more. Popular Posts & Search Terms. My “Overcoat” post is still the most popular on the blog, followed by my list of pre-revolutionary Top 10 Greatest Hits. Next: Dostoevsky’s The Possessed/Devils, Pushkin’s Belkin Tales, and Ulitskaya’s Daniel Stein. The giant surprise for this year is at number 7: my post mentioning the New York Times article about Elena Chizhova. Variants on Chizhova’s name are among the top searches for the past year, too. I wish I could say I enjoyed her Booker-winning Время женщин (A Time of Women) more than I did. The combination of “Prussian Bride” and “Buida” comes up consistently, too. Buida’s books never seem to be available when I look for them; I may need to order something up through interlibrary loan one of these days. Vladimir Sorokin my email. Is someone treating Google as a seer that knows why Sorokin hasn’t answered an e-mail message? 600 Pages of Dostoevsky. I can’t read this querier’s mind but want to think the person sought a recommendation of 600 especially interesting pages of Dostoevsky. Well! Six hundred pages eliminates most of the big books, (if they’re printed in legible type and/or sold without a magnifying glass), though some translations of Crime and Punishment weigh in with page counts just under 600. Not a bad option, of course, though my personal choice would be selected short novels and stories. There’s lots to choose from: the “Grand Inquisitor” section of The Brothers K., Notes from the Underground, The Gambler, White Nights, House of the Dead, and the derivative but important Double… There are plenty of other Dostoevsky short novels and long stories I keep promising myself I’ll read. On that note, I’ll leave and say another huge thank you – огромное спасибо – to all of you for your visits, encouragement, and reading suggestions over the last three years! Cupcake photo: nazreth, via stock.xchng. I love the fast pace of the Yasnaya Polyana award process: the winners were named today, only a month after I wrote about the finalists. Mikhail Tarkovskii won for his story collection Замороженное время (Frozen Time), about people who live along the Yenisei River. One story from the collection, “Дед,” is available on Tarkovskii’s Web site. (If only it had paragraph breaks!) Other pieces, including “Кондромо,” which was a Belkin Prize finalist in 2003, are on Журнальный зал. Mikhail Kuraev won the Contemporary Classic award. Kuraev is a versatile writer: I didn’t initially recognize his name, but then noticed that he wrote the screenplay for Петя по дороге в Царствие Небесное (Pete on the Way to Heaven is the IMDB title), which I’ve read about. As I wondered through lists of his work, I found that three of his novellas have been translated into English: Duke University Press published Night Patrol and Other Stories, translated by Margareta O. Thompson, in 1994. It includes the story about Pete/Petya that Kuraev adapted for film; Library Journal reviewed the collection favorably. 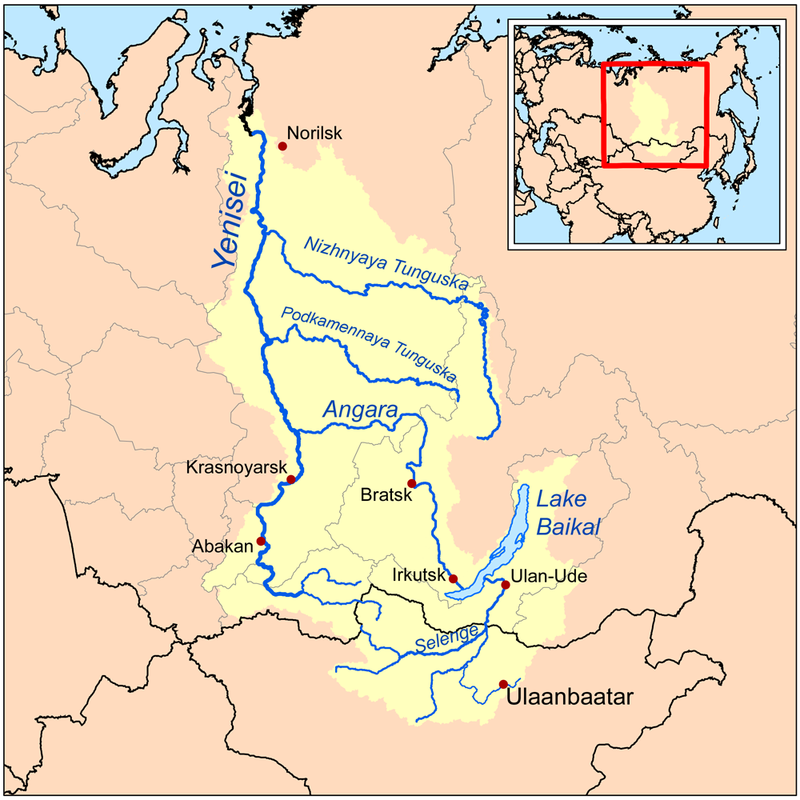 Журнальный зал has links to some of Kuraev’s other works, here. 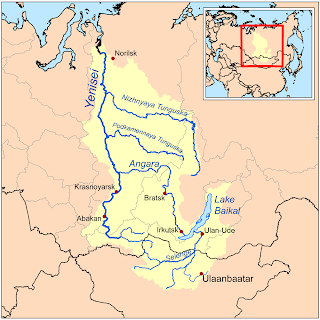 Image credit: Map of the Yenisei Basin from Kmusser, via Wikipedia Commons. Most literature watchers are waiting for the announcement of this year’s Nobel Prize for literature but I’m happy with today’s announcement of the Russian Booker short list. The six finalists were selected from a 24-member long list; 95 books were nominated for the 2010 Booker. The winner will be announced in early December. There are two books on the list that I’ve read, two others I’m familiar with, and two whose authors I’d never heard of before now. Here’s the short list, in (Russian) alphabetical order, by author. Mariam Petrosian: Дом, в котором... (The House in Which…), which won third prize in the readers’ vote for last year’s Big Book Prize. I bought Sviatoslav Loginov’s Свет в окошке (The Light in the Window) solely on the recommendation of friends who’d loved it. I didn’t read a description of the book… so was a little surprised (though I’m not sure why) when an 84-year-old man, Il’ia Il’ich, died in the prologue and then found himself naked, but for a pouch of coins around his neck, in a sort of limbo. He soon wonders what will become of his books. Loginov creates a vivid picture of the afterlife, where the living dead receive direct deposits into their pouches when people on earth (i.e. those in the first life), remember them. The liveliest people in this limbo reside – somehow, “live” doesn’t feel quite right – in ethnic enclaves that preserve traditions from their home countries; many famous and infamous people, who are remembered constantly, live in a guarded place called The Citadel. Loginov is able to achieve an effect similar to time travel by telling stories of long-term residents; Gogol even makes a cameo appearance. What I found most interesting in The Light in the Window was Loginov’s exploration of memories of the dead: the reader learns, along with Il’ia Il’ich, how people in this limbo eventually fade away when the earthly people and documents who remember them die out. Loginov sets up interesting situations through Il’ia Il’ich’s relationships with family members who died before him: Il’ia Il’ich never knew his father, his son died young in Angola, and his wife committed suicide. Their interactions with Il’ia Il’ich allow Loginov to elucidate the mechanisms of limbo – such as the eeriness of the ghost phase of existence and the burdens of guarding the Citadel – and emphasize Il’ia Il’ich’s aloneness even before his money wanes. Being undead isn’t easy but Loginov includes some neat tricks that bring in a little fun without feeling too gimmicky: the undead can spend money to fulfill certain wishes, like obtaining the ability to speak other languages. I can’t recommend The Light in the Window as highly as my friends did because I don’t think Loginov is always successful at combining his fantasy material and his memory material (I can’t quite call it philosophy) into a cohesive novel. But the book is memorable, and I think Loginov does a decent job addressing a dreaded topic without excessive moroseness or sentimentality. I don’t know about you, but I often think about memories and the dead, remembering real people I knew who died and wondering, more abstractly, how long our collective memory of ordinary people lasts. Now, of course, I’ll probably also think of Loginov’s coin-based system – and those automatic deposits into the pouch – when I remember my own friends and relatives who live primarily in the precarious limbo of memories like mine. Level for Nonnative Readers of Russian: Moderately difficult, 3.5-4/5. Up Next: Lenoid Iuzefovich’s Казароза (Kazaroza). This must be the first novel I’ve ever read where Esperanto plays a major role.